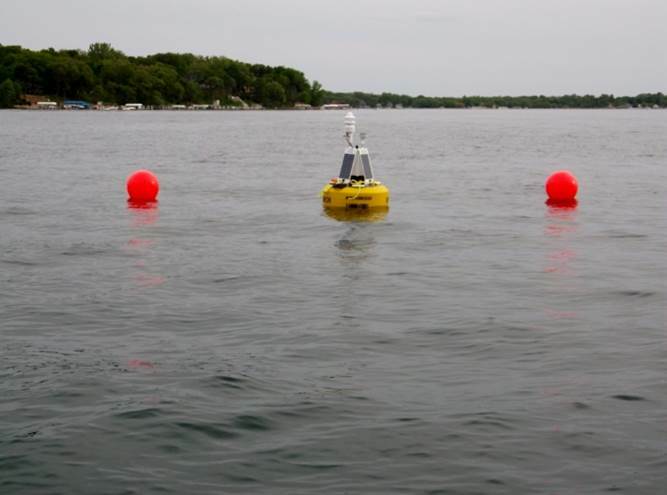 Iowa Lakeside Laboratories has installed a hydrological buoy on West Lake Okoboji. The purpose is to collect West Okoboji lake data that will be helpful for improving water quality. Each 10 minutes the buoy reports by radio the air & water temperature, relative humidly, barometric pressure, wind speed, wind direction in degrees, and rainfall. The data being measured can be viewed online at www.wqdatalive.com/public/470 In order to view the data place your cursor on the green dot marked the buoy location. The public data is displayed in American units while researchers receive the data in metric values. For Apple and Android phones there is an app called “Wqdata LIVE”. The new buoy is in 90-feet of water about 800-feet West of the northern end of Sunset Beach. The geographical coordinates are 43 degrees 21.931 minutes North – 95 degrees 8.755 minutes West. At night the buoy is marked by a yellow flashing light. The DNR hazard buoys use a white flashing light. Phase II – later this summer – might measure water temperature and dissolved oxygen at two meter levels to the bottom. The new buoy will be removed in the fall prior to ice over. The Lakeside Faculty on Tuesday, June 2nd, at 7:30 PM in Mahan Hall will have a presentation on the new research buoy. Dr. Evelyn Gaiser, from Florida International University will discuss how data generated by the buoy benefits the global scientific and Iowa Great Lakes communities through linkage to the Global Lake Ecology Observation Network (GLEON). Financial support was provided by the Okoboji Foundation, Okoboji Protective Association, Dickinson County Clean Water Alliance, Friends of Lakeside Lab, State Hygienic Lab, University of Iowa Office of Research and Economic Development, Iowa Lakeside Lab Regents Resource Center, Iowa Department of Natural Resources, and Danbom Engineering.